The campus Bookstore and Convenience Store will begin relocating this week into their new space in the expanded North Wing of the Carlton Union Building. The Post Office and Copy Center are scheduled to begin their move on July 26. Students will get their first glimpse of the CUB’s new North Lobby when they return in August. In this rendering, students are walking toward a double doorway that leads into the new bookstore. The wing’s second floor will open by January 2018. The Bookstore and Convenience Store will be co-located in a space significantly larger than their previous combined spaces and will be connected to the Post Office and Copy Center on the wing’s first floor. Those campus services are the first ones to relocate back into the North Wing as part of Phase One of the three-phase expansion and renovation project. “The Bookstore and Post Office will be in operation in the renovated and expanded North Wing when the fall semester begins,” said Al Allen, associate vice president for Facilities Management at Stetson. Classes begin Aug. 24. A rendering shows the back of the Carlton Union Building when the renovation is complete in late 2018. The CUB, originally constructed in the late 1950s, is being expanded to offer more space for campus dining, student activities, and student offices, meeting rooms and lounge. The expanded CUB will provide new offices for student organizations, including the Student Government Association and student online-radio station, WHAT. Those student areas on the second floor of the North Wing are scheduled to open by January 2018. While the administrative offices of the Cross Cultural Center will be located in the CUB, the current Cross Cultural Center space will continue to be for activities and events. Valinda Wimer, director of Purchasing and Business Services at Stetson, said the new Post Office is set to move in the last week of July. It will be larger and offer four service windows for the Stetson Community, instead of just one previously, for students to pick up mail and packages, and for shipping requests. 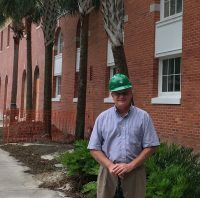 Al Allen, associate vice president for Facilities Management at Stetson, stands outside the Carlton Union Building’s North Wing, which will house an expanded bookstore, convenience store, copy center and Post Office by early August 2017. The Copy Center will have copiers and a wide-format printer for posters and other items. It also will help handle requests for Stetson stationary, business cards and other items, although those items still will be printed in the Administrative Services Building at North Amelia and East Wisconsin avenues, and delivered in golf carts. A new Bookstore and Post Office are among the changes that students will see when they return for classes in August. In the Commons Dining Hall, the food serving lines have been moved temporarily into the former Coffee Shop, and dining tables are available in the Commons and in the former Faculty Lounge. 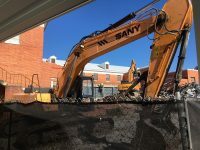 Workers have demolished a section of the back of the Carlton Union Building this summer to make room for a new dining room and kitchen. Phase Two of the project includes demolition of a significant amount of space on the east-facing side of the CUB. This is necessary to construct the new kitchen, serving areas, additional dining space and the east-facing patio. The new dining facilities and kitchen will be ready when students return for fall semester of 2018. As part of the CUB project, the Student Health Center, Student Counseling and the Office of the Chaplain/Religious and Spiritual Life are currently scheduled to move into Griffith Hall over the 2017 fall break and be open for students on Oct. 4, Allen said. Afterward, Offices for Campus Life and Student Success, including Lua Hancock, Vice President for Campus Life and Student Success, and Lynn Schoenberg, Dean of Students, will relocate from the CUB into the spaces formerly used by the Student Health Center and Counseling Center. The Campus Life and Student Success staff will move back into the CUB in late December 2018 when Phase Three of the project is scheduled to be complete. When the project is done by the end of 2018, the CUB also will feature a renovated South Wing with the return of the Coffee Shop and Faculty Lounge.